The tale of much of Barbara McClintock’s life is that of the scientist working long hours with a microscope seeking to solve mysteries. The mystery she spent most of her career trying to solve was how all cells in an organism can contain the same DNA, and yet divide to produce cells serving different functions; basically how cells differentiate. And for that, she got a Nobel prize all to herself, which is no small feat either. McClintock was born on June 16, 1902, in Hartford, Connecticut, USA. From age three until beginning school, she lived with her aunt in Brooklyn, New York while her father strove financially to start up a medical practice. She was a solitary and independent-minded child, a trait she later called her “capacity to be alone”. In 1919, she began her studies at Cornell’s College of Agriculture and took her first course in genetics in 1921. A year later, due to the interest she showed in genetics, she was invited to take the graduate genetics course at Cornell. It was here that she became interested in the new field of cytogenetics, specifically of maize or corn. 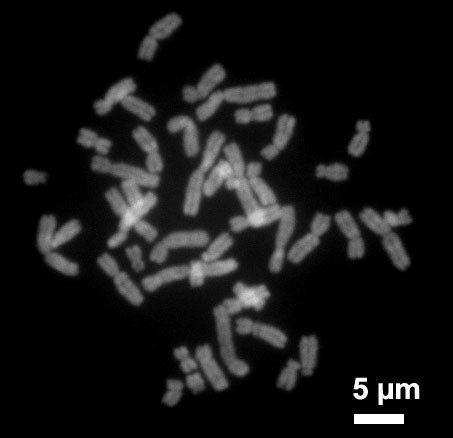 Cytogenetics studies how the chromosomes relate to cell behavior, particularly during cell division. Chromosomes are the long strands of DNA within the nucleus of every cell and shown here in the photo at a time when they are condensed, or coiled up. While still at Cornell she developed a number of methods for visualizing and characterizing maize which ended up in textbooks. She also became the first to describe the morphology of the ten maize chromosomes, basically their form and structural relationships, which then allowed her to discover more about the chromosomes. One of her colleagues observed that ten of the seventeen significant advances made in the field at Cornell between 1929 and 1935 were hers. This was only the first step in what would be the remarkable career of a very well respected scientist. McClintock valued the freedom to pursue research exactly as she wanted, without interference or outside direction. By 1931 her reputation was so good that she was granted that freedom through a series of fellowships, paid times during which she could travel and pursue research at different locations. Her work during the fellowships was significant. For example, during the summers of 1931 and 1932, she was introduced to using X-rays as a way of increasing mutation rates. This work led her to discover telomeres, repeating sequences at the end of chromosomes that protect the ends and that prevent neighboring chromosomes from connecting to each other. You may have heard of telomeres as they relate to aging. In 1936 she took an Assistant Professorship job at the University of Missouri. During this time she again did important work, such as discovering the breakage-fusion-bridge (BFB) cycle, a source of chromosome instability which is still important in cancer research today. However, she felt that she was being excluded from staff meetings and promotional opportunities and had other issues that made her decide to leave in 1941. She next took a full-time research position working at Cold Spring Harbor Laboratory, a private non-profit research institution in New York. Her job was to do science at her own pace, which for her meant long hours working hard at problems that interested her. It was exactly the type of freedom she wanted and she spent most of the rest of her career there. It’s interesting to follow McClintock in action, and for that, we’d highly recommend the book, The Tangled Field by Nathaniel C. Comfort. Roughly, the process involves a season of growing the maize under careful control, followed by analysis of the maize in the lab, then theorizing about the results, putting together a plan for the next crop, and then planting it. 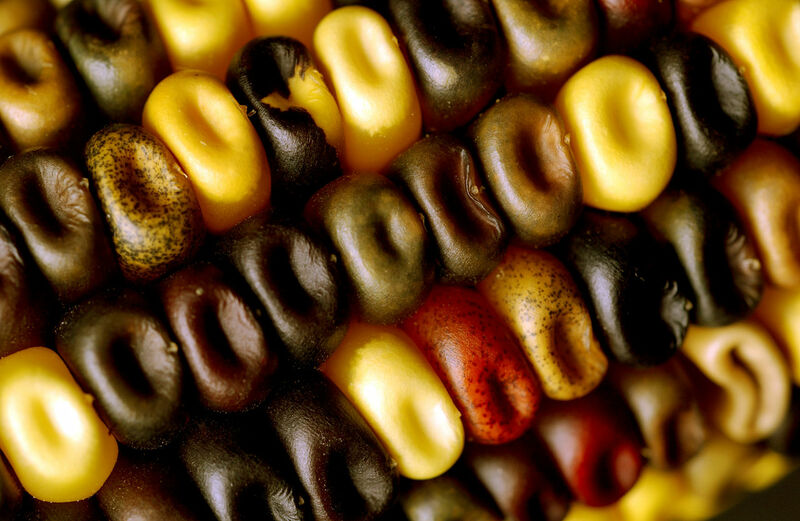 Unlike the uniformly yellow kernels found on maize most are familiar with, for some maize the kernels come in different colors and even with spots or patches. 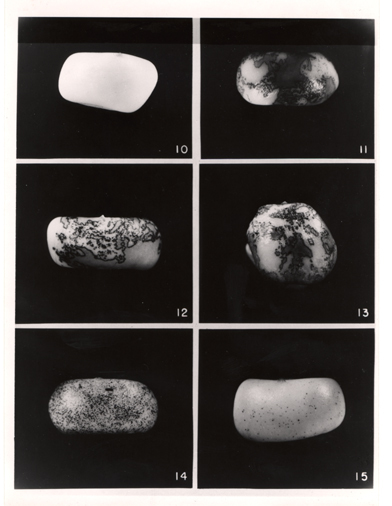 Much of McClintock’s analysis and theorizing involved examining the patterns of colors of the kernel’s skin and the corresponding chromosomes of the cells making up that skin and trying to deduce what caused the particular patterns. Specifically, she’d look at changes at certain loci on the chromosomes, roughly what we’d now think of as the locations of genes. She’d give them names such as the Ds locus for the “dissociator” and Ac locus for the “activator”. It’s not clear if the “this thing” was either Ac or Ds but from her notes of April 18, 1948, Ac had moved from a location far from Ds to one near it. This was the discovery of transposition, that some genes moved around on the chromosome. It was this discovery that won her the Nobel prize in 1983. Maize kernels. All have Ds. 10 has no Ac, 11-13 have one Ac, 14 has two, and 15 has three. But transposition wasn’t what she was after. She wanted to figure out what made the cells differentiate. Her driving theory was that the colors on the kernels were driven entirely by behavior involving the chromosomes, and she referred to what she sought as the “controlling elements”. She collected a tremendous amount of data, recording complex sequences of events involving different loci on the chromosomes and trying to interpret what was going on. The sequences became so complex that many had difficulty following her explanations. She wrote long, detailed letters of her progress to colleagues, however, her published articles and talks at symposia from 1950 to 1953 produced mixed reactions or silence. A number of reasons have been suggested for this. For her 1950 article in the Proceedings of the National Academy of Sciences, she gave her theory but held back on the data. She had a reputation for thoroughness in reporting and it’s perhaps that dedication which prevented her from revealing too much when she felt she wasn’t ready. Her talk at the 1951 Cold Spring Harbor Symposium also lacked data and received a mixed response. It may also be that her intention was mainly to stimulate research along similar lines. Another possibility for the mixed reactions was that much research had shifted from flies and maize to bacteria and viruses. Yet another was a shift from the chromosome alone to a one gene-one enzyme approach, where genes coded for enzymes and the development of an organism relied on a system of chemical reactions controlled by genes. In 1953 she published an article in Genetics wherein she provided more data but for some of the theory, accompanied them with statements such as “Evidence in support of this assumption has been obtained (McClintock unpublished).” Given the reactions she was getting, from then on she published less on controlling elements, though her work on it was mentioned from time-to-time when similar activity was found in other organisms. In 1957 she was asked to help train a young scientist to do cytological (cellular) studies of maize in Latin America. For that, she went to Lima, Peru. That began a period of work wherein she studied the evolution of maize at the chromosomal level, primarily by examining the knobs at the ends of chromosomes from maize grown in different regions. This fit well with her cell differentiation work as she felt that the knobs were regulators of gene action. In 1967, McClintock retired from the Carnegie Institution, the organization that employed her during her time at Cold Spring Harbor. However, she was made a Distinguished Service Member, allowing her to continue activities at Cold Spring Harbor as scientist emerita. In 1983, she was awarded the Nobel prize in Physiology or Medicine for her discovery of transposition. 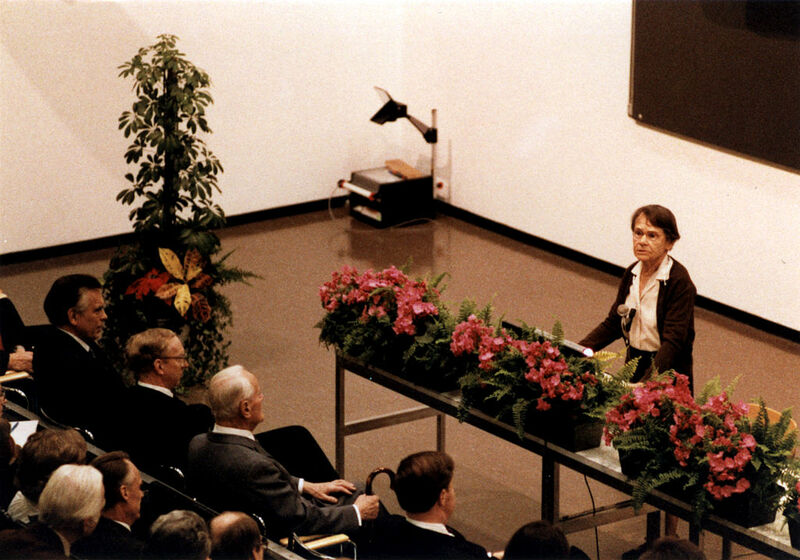 It’s impossible to sum up Barbara McClintock’s life and achievements in a single article. We’ve left out many discoveries, awards, and appointments to prestigious bodies. Though she never married, she did have a large number of friends and colleagues with whom she interacted regularly. On September 2, 1992, at the age of 90, she died of natural causes. For the 1930’s that’s alone is remarkable. I complain when you do things wrong. This time I’m applauding when you get it right. Now if (instead of insinuating) you’d go to the length of pointing out *one* hackaday article of the kind “Here is this woman who etc. etc.”, one of those you disapprove of, *that* would be more interesting. Otherwise, your post is just an empty insinuation and doesn’t lead to a productive discussion. This article makes me think that I would love a nice home lab CRISPR intro, along with some useful CRISPR hacking, like maybe a more alcohol resistant yeast or spider silk protein generating scum. +1! Dear Santa, I want a Venus Flytrap big enough to make rabbits in my garden a non-issue. Also, has anyone seen the neighbor’s cat?